USERS of a popular performance venue are ‘interested’ to find out more about renovation plans. Yesterday Fareham Borough Council revealed a proposal to transform Ferneham Hall into a community and entertainment venue. The multi-million pound plans, which includes two auditoriums – one of which would include a screen and projector – community rooms, and a dance studio, will be considered by the council’s Executive next month. Fareham Musical Society (FMS) is one of many local groups that use Ferneham Hall regularly to stage their performances. 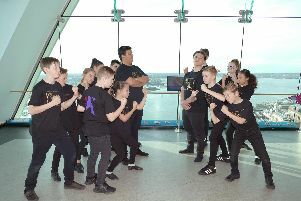 Other groups which use the theatre throughout the year include Gosport Gang Show and South Downe Musical Society as well as a number of touring tribute acts and shows. Executive Member for Leisure, Councillor Sue Bell, said: ‘Our vision is to provide a busy community and entertainment venue which includes daytime and evening activity, seven days a week. If approved, the scheme would see the theatre’s main auditorium cut from 700 seats to 408 after evidence showed half the seats are empty for most performances. It could be shut for up to two years towards the end of 2019 while the work is carried out, but will remain open as normal in the meantime. Funding for the plan is expected to be drawn from the Community Infrastructure Levy which is a planning charge on new developments that the council can spend in the local area.